Goal Line Technology is a technical means of instantly determining whether or not the whole of the ball has crossed the goal-line, not more and not less. Labosport have been certified by FIFA as a test institute to undertake the final installation testing of GLT systems. This involves a detailed series of tests at each venue in which GLT is going to be used. The rigours tests designed by FIFA are intended to assess the GLT system to ensure it works as designed. 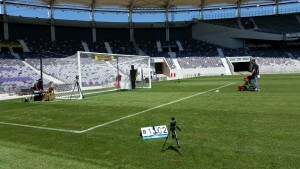 Labosport have tested all 12 world cup venues in Brazil for FIFA for the world cup for Goal Line Technology.